Erythropoietin (EPO) is a glycoprotein that stimulates production of red blood cells, which function to distribute oxygen from the lungs to the rest of the body. Recombinant EPO products are used to treat anemia (low numbers of red blood cells) resulting from chronic renal failure, cancer chemotherapy, and HIV drug complications, and to boost red blood cell levels prior to elective surgeries. Annual worldwide sales of recombinant EPO products are ~ $6 billion. 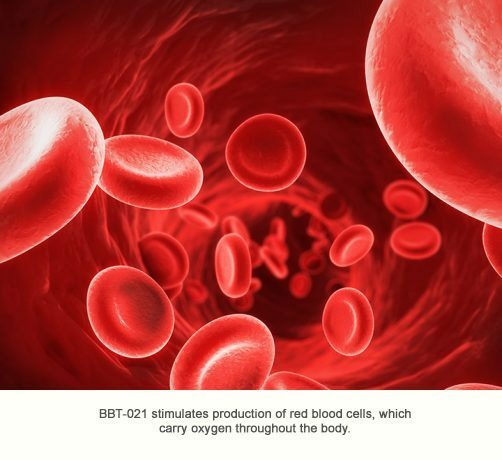 BBT-021, a long-acting EPO ImmunoFusion protein, has a significantly longer circulating half-life than EPO and is more potent than EPO at stimulating red blood cell formation in animals.